We’re throwing the biggest party of the year to say thank you! 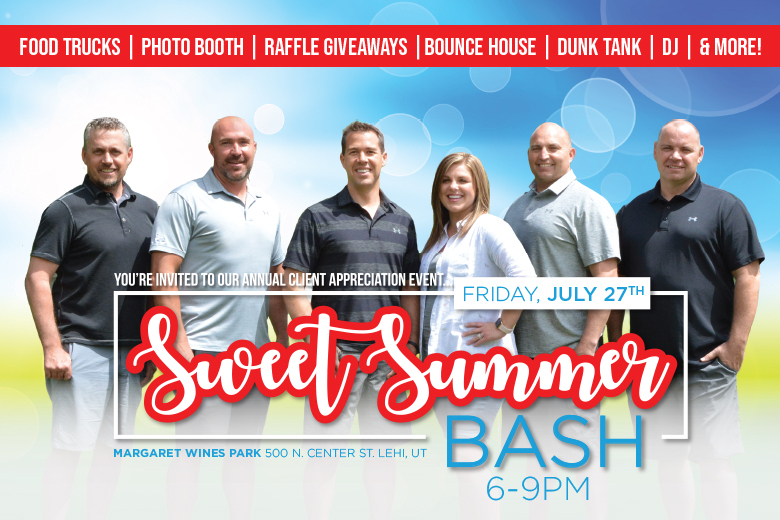 Join us for our annual summer client appreciation event, the Sweet Summer Bash and walk away with a full tummy and memories of a wonderful time. This year’s event will be better than ever before. We want to show you the best summertime carnival yet, so there will be a variety of yummy food trucks,a mechanical bull ride, fantastic summer music & dancing with a live DJ, a dunk tank, funny photos at a photo booth, children’s face painting, bounce houses and slides, raffles prizes, and of course, sweet treats like Cotton Candy and Snow Cones. Mark your calendars and join us for an incredibly Sweet Summer Bash on Friday, July 27 from 6-9 pm at Margaret Wines Park in Lehi, Utah. Bring your family and friends and don’t forget to RSVP at bigkeyevents.com.